It seems the Contacts team has started rolling out some changes to the new Contacts Preview site. I say new, but its well over a year old now. The changes seem to be mostly cosmetic and one functional change that I noticed. The design seems to be even more material design than it was previously. 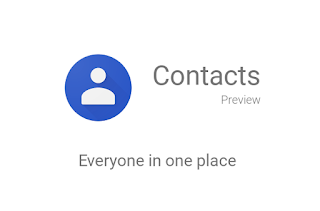 The organization of the main contacts listing seems to tighten up the space a bit, with starred contacts still listed at the top. It seems that Groups are no longer called groups, but instead are now Labels. 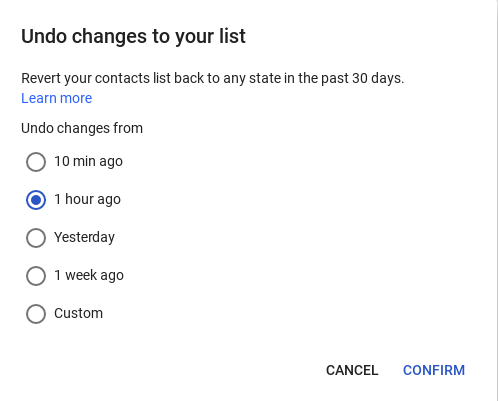 This makes things a bit more consistent with how these are named on the Android contacts app, and it keeps consistency with Gmail labels as well. A major change that you will notice is there is no longer any mention or listing of G+ circles in this update. I am not sure why this was, other than to speculate as there were lots of complaints in the forums about circles being in people's contacts. There is a new feature in the left side menu called undo changes. This brings up a popup with preset and custom time settings for which you would like to undo the changes. This is pretty neat, and can come in very handy. I think these changes are welcome and well done. 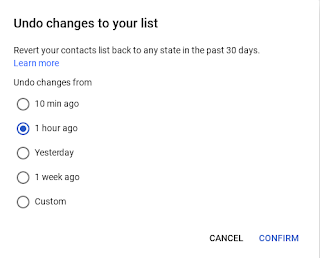 I just wish they would concentrate on adding back the functionality that is in the "old contacts" such as being able to import contacts from a csv. How about saving groups or labels in Inbox that can be used as a group email?